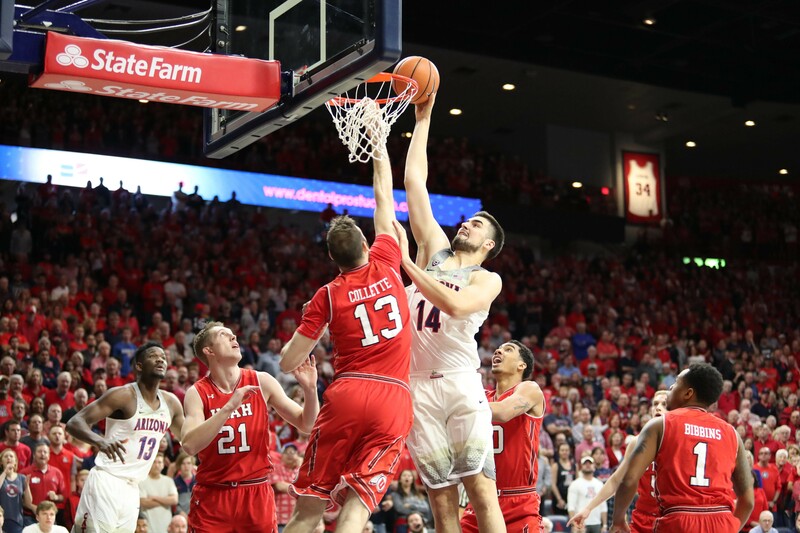 Arizona senior forward Dusan Ristic was named to the Pac-12 All Conference team, averaging 12.1 points per game and 7 rebounds this season. BOISE—Members of the Arizona Wildcats gathered around the semi-circular row of lockers tucked deep inside Boise's Taco Bell Arena, ahead of their final walkthrough on Wednesday. The fresh-faced cadre of stars assembled in the undersized, sterile locker room will soon do battle with an undersized, scrappy cast from far-away Buffalo, but for now strike a relaxed, confident tone. Take, for instance, 7-foot Serbian center Dusan Ristic, who's lounged out in the corner of the locker room, shooting the breeze with anyone that passes. Then there's the unmistakable presence that is freshman Deandre Ayton, who's cracking jokes and his trademark ear-to-ear smile in the center of the room. It's hard to tell that these dozen or so personalities are some 27 hours away from the cruelest, most exciting three-week spectacle in American sports, the NCAA Tournament. That tone will change by 7:40 p.m. local time tonight, when the Wildcats' will get down to business in the first round against the Bulls. For Ristic, it's been a dream senior season, on the court at least, earning an All-Pac-12 Second Team selection, thanks to averaging 12.1 points and 7 rebounds per game this season. "[It feels] so special right now. It's my last shot here. I'm trying to do something special and advance deep in the tournament," Ristic said. "I'm trying to go game by game, just win every game that we play, no matter who our opponent is." Ristic will likely draw Buffalo junior Nick Perkins come Thursday night, who's excelled for the Buffaloes this year, scoring 16.6 points and 6.2 rebounds per game for Coach Nate Oats. He knows that stopping the 6-foot-8-inch forward will be difficult, but believes Coach Sean Miller and Associate Head Coach Lorenzo Romar have done a good job preparing the team for whoever they'll face in the tournament. "We play against Buffalo and they're a really good team," Ristic said. "They have three or four players who are averaging more than 15 points a game. So it's going to be a great challenge for us to play against a team like Buffalo. For now we're just ready for the game. We're 100% focused and that's it." For sophomore guard Rawle Alkins, the key to Thursday's opening round rests in the team's camaraderie and resilience under pressure. The Brooklyn native, who's averaging 13.4 PPG this season, believes the team's ability to win both the Pac-12 regular and conference tournaments, despite the whirlwind of scrutiny from the FBI's arrest of former assistant coach Emanuel "Book" Richardson, shows how cohesive a unit they are. "We're a tight-knit team," Alkins said. "Lots of people probably can make an assumption that with the stuff off the court, it's easy to go south. But i think that stuff probably brought us closer together and made us a closer family." Alkins loves the win-or-go-home drama of the Big Dance, and knows how high the stakes will be against the Bulls. He also knows that this year's squad has been rather impervious to said pressures, and that they'll go about their business the same as they have all year. "Everyone's going to be running a lot harder, playing a lot harder, running faster," Alkins said. "We just have to play every game like it's our last. We understand that, it's win or go home. So, we're going to bring our game and not give in."